February 16, 2016 by Ecommerce News. About Logistics with tags Switzerland. 1116 views. Cargo Sous Terrain (CST) has plans to run an underground freight transport system in Switzerland. In the tunnels, autonomous vehicles will transport pallets and packages between major cities and towns in the Central-European country. The group hopes to have this innovative network up and running by 2030. CST, which consists of several companies and institutions such as IG DHS, Swisscomm, Swiss Post and the Zürich civil engineering office, now wants to build a 70 kilometer tunnel between the Härkingen/Niederbipp region and Zurich that should be ready for use in 2030. 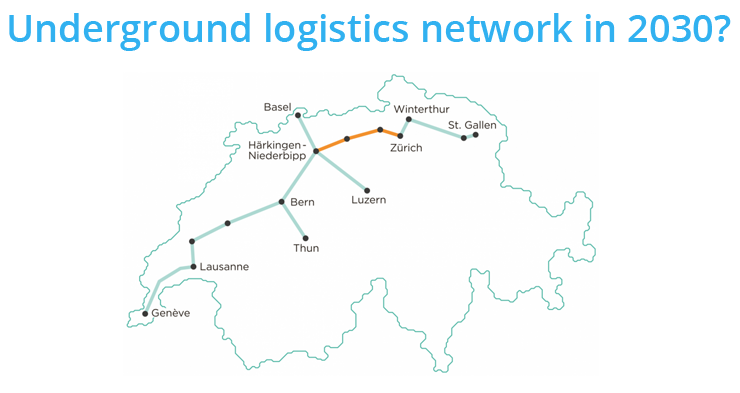 After that, the plan is to expand CST in stages to a total network in Switzerland, so goods can arrive and leave at any place, from Geneva to St. Gallen and from Basel to Lucerne. The foundation has launched a website where it reveals it plans, including a video that explains how the tunnel network should operate. But it’s not only a tunnel, the Cargo Sous Terrain consists of two components: an underground transport tunnel and an efficient, environmentally friendly distribution of goods in the urban centers. In the three-lane tunnel, vehicles on wheels will transport goods at a constant speed of 30 km/h. At the access points (hubs) the goods can be carried on or taken from pallets and containers who automatically take part in the system. In the urban centers, CST distributes the goods to their destination with bundled rides in environmentally friendly and silent electrical cars, scooters and vans. Last year the foundation has carried out as feasibility study, which has shown that the system is feasible both in technical and economic terms. After the proof of concept, CST is now focusing on writing a business plan and having meetings with potential investors. The association wants to take the first steps towards the constitution of the future carrier and operating company.